Led Zeppelin's Jimmy Page and Robert Plant are in a Los Angeles courtroom this week defending their most well known song "Stairway to Heaven" against charges of plagiarism from the estate of Spirit guitarist Randy California. Led Zeppelin has been in this situation before, as have many other rock artists. 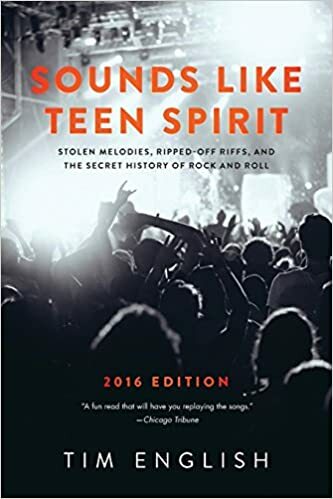 Tim English has updated his book Sounds Like Teen Spirit, which provides examples of stolen melodies and riffs from recent plagiarism cases involving Robin Thicke, Sam Smith, and Coldplay along with famous cases like George Harrison's "My Sweet Lord" vs The Chiffon's "He's So Fine", The Doors "Hello I Love You" vs The Kinks "All Day and All Night" and many more from throughout rock music history. A great discussion of the age old question - when is the line crossed from inspiration to outright theft?